iPad is new apple way to view and consume content (lots of content) in grand big screen style. It is bigger than iphone but smaller than laptop screen. In-spite of limitations like no multi-tasking or USB support – it is creating lot of buzz and people wanting this Apple creation. Many web content providers have launched respective apps for allowing users to access their content on iPad tablet. Here are few selected and best iPad apps. 1. 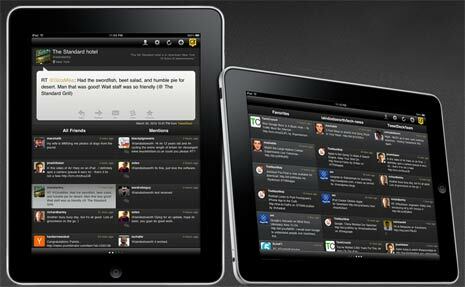 Tweetdeck app allows you to tweet in grand style with jumbo interface for better reading, writing, filtering of tweets. It also has in-built browser window for viewing weblinks shared in tweets. 2. ebay for ipad app allows you to use ebay services and commerce on ipad tablet. Search and price listing of products is specially designed for big screen format of ipad. 3. Gmail & Youtube apps are in-built in iPad. They allow neater and more easy way to browse Gmail inbox in 2 panes format. Wide screen format allows better viewing of HD videos on Youtube website. 4. ibooks app allows you to read ebooks in pure ipad tap and flip style. You can flip through pages of a book for easy and comfortable reading. 5. Kindle for ipad app matches best offering of ibooks app for ebooks. It supports animated page turning, adjustable font size and brightness while you browse for books of your interest. 6. Stumbleupon app let you stay connected with activity of best weblinks shared on stumbleupon. iPad customized look to stumble of websites of your interest. 1. New York Times editor’s choice is a free app for iPad for accessing selection of news, opinion and feature articles chosen by Times editors. You can browse latest articles on news, business, technology and more on iPad device. 2. The Wall Street Journal free app allows access to all free articles from this reputed source. Lot of free stuff for informative reading, subscribers can get access to even more premium content. 3. AP news app allows you to access and browse news content in a neat manner. It displays latest news along with images, videos and lots more. 4. BBC news app offer latest breaking news from the BBC network. Stories are arranged by geographic region and category including business, technology, entertainment and sport. 1. ABC player app allows you to view top ABC programs supported by advertisements. 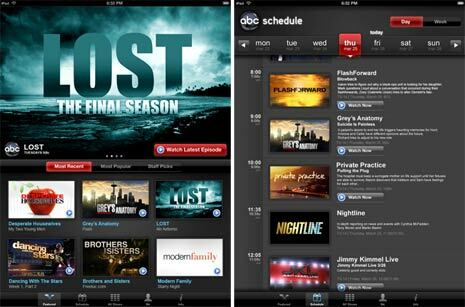 You can watch episodes of Lost, Grey’s Anatomy and many more popular shows. 2. Yahoo Entertainment app let you access all the juicy entertainment content from Yahoo network. Celebs, gossip, news, sports – its all in the offering for free. 3. Pandora radio bring all the music with the goodness of big iPad screen. You can easily lot of information about artist, songs and more without having to switch views. 4. NetFlix app let you watch any movie you want. It gives access to 1000s of movies and tv shows available for viewing. Browse, queue up and watch stuff you want. Good list. I did an expanded version that might be helpful to those looking for iPad Apps. The Best eBook App for iPad: iBooks or Amazon Kindle?